I was sent a few samples of the juices mentioned below to taste; hubby, myself and the boys all enjoyed them. I particularly liked the blueberry lemonade flavour. I made the TrueBlue party punch and it was delicious - definitely a great way to work in superfruits to your summer party menu! Balmy summer nights beg for chilled patio drinks and backyard barbecues. But before you reach for the rosé, consider fixing yourself and your loved ones a drink with Superfruits. Not only are Superfruits rich in antioxidants, but those sweet-smelling berries are great for the brain, heart and overall health. Whether you’re planning a family picnic, or a mommy’s night off, here are four delicious ways to work Superfruits into your summer party. TrueBlack Sangria is a simple recipe that is bursting with fresh fruit and flavour. Squeezed for time? Mix this sangria the day before and it will be just as tasty. 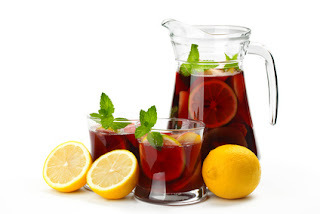 The not-so-secret ingredient to this sangria is new TrueBlack juice made from grape, blackberry and aronia berry juice. The Antioxidant Blutini combines the flavours of TrueBlue with citrus and nutty liquors to create a smooth, refreshing cocktail. 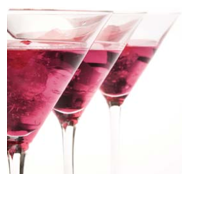 Get your superfruit fix shaken over ice with this blueberry based cocktail that is high in antioxidents. Not only will this party punch withstand the taste test, it contains no artificial flavours, colours or preservatives. Wild blueberries top the superfruits chart and have been linked to promoting memory and brain health. It’s not hard to convince kids to get on board with TrueBlack Blackberry Popsicles especially if you add fresh blueberries and blackberries! Simple and delicious, this is a treat that parents can feel good about offering their kids. TrueBlack Blackberry is all natural and packed with nutritious berry juices rather than sugar. Combine honey with yogurt. Pour an inch of yogurt into the popsicle molds, then an inch of TrueBlack juice, and repeat until the molds are filled. Use a chopstick or skewer to gently swirl the liquids together. Freeze overnight. OOOh the Popsicles sound delish! I am hoping to make them next week with the boys! I think I'd like to try that sangria! I love cocktails! cool and refreshing. oh yum- those sound delicious! I think my kids would love those popsicles! yes - I can't wait to try the popsicles too! The popsicles would be a hit around here. Great summer time recipes - thanks for sharing. Love the popsicle idea! And the other drinks sound yummy as well. Love blueberries! I have only recently become a fan of blueberries (in the last year or 2) thanks for saying hi! You had me at Blueberry Lemonade... this I have to try. it is delish - my favorite of the 4 flavours! The Blutini sounds fabulous! A drink right up my alley!! The sangria sounds a.m.a.z.i.n.g! Just in time to enjoy during the summer.